How Could I Have Missed It?! Just about every day I drive down Avalon. Yesterday I noticed something was different. Something that had been there was no longer there. It was gone. And it wasn’t something as small as a mailbox or a stop sign. No… it was bigger. In fact it was something huge. It was a landmark that had been there for years. It was at least four or five stories tall. 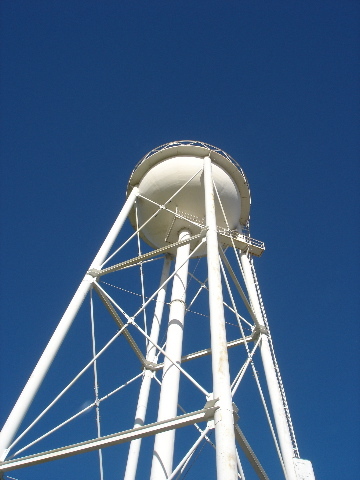 It was a water tower! It was on the corner of Avalon where I turn to go to the football practice field. The place where I coached the 7th & 8th Grade Middle School football team last fall. That means for August through November I turned right by that water tower five days a week. Then at some point after that it was taken down. So when I realized yesterday (May 15, 2007) that it was no longer there, I was shocked. Then it got worse when I was told they took it down last fall. LAST FALL! (Update: I have found out it was removed in December of 2006.). If you have an idea of how I missed it, tell me either at church… by email… phone call… or someway because I think I may be slipping. The same way someone can shave off half of their mustache and it not be noticed!! We see what we expect to see, and become so familiar with those things that in our distracted state of mind we often miss the obvious. It is a little frightening, but believe me you are not slipping. Or if you are you have a lot of company. If you are slipping I am way ahead of you. I had not noticed it was missing and don’t know when I would have if I had not read your blog. Thank you Beth! At least I now know that I’m not the only one who didn’t know it was gone. I have a call in to the city to find out exactly when it was removed. I actually saw them taking it down. If I had not seen it coming down, I probably would have not noticed that it was gone. I think that we are just creatures of habit and assume/like things to stay the same.